When you first get your braces, they may rub on your lips and cheeks. Place wax over the rubbing bracket before these spots get raw and painful. A warm salt water rinse several times a day can speed healing. The skin will soon toughen up so that you don’t need wax. When you first get your new appliances, your mouth may be tender or sore. This soreness should resolve itself after a few days. If the discomfort is severe, you are welcome to take Aspirin, Tylenol®, Advil®, or any pain reliever that you would normally take for headache or discomfort. In order for the braces to move your teeth, the teeth first have to be loosened our of their current positions. It is a normal part of the orthodontic process. The teeth will eventually become fixed in their new straight positions by end of your treatment. At the end of each visit, we will ask you to complete some steps to ensure that your treatment will progress and that you will be comfortable until your next visit. Sweeping your finger and tongue across the braces will ensure that there are not any clipped wire ends could poke your cheek or tongue. Make sure you understand what your instructions until your next appointment; for example, wearing an appliance or elastics as instructed, adjusting an expander or following specific hygiene or diet instructions. Make sure you enough dental wax, rubber bands or other materials you may need between appointments. Please be sure to schedule your next appointment before leaving the office. Waiting 1-2 weeks after an appointment before scheduling your next office visit complicates the scheduling process. Appointments are made at 2-8 weeks in advance. Dr. Stachel will determine the intervals between appointments, depending on your stage of treatment. Make sure that your questions about treatment are answered. We will achieve our beautiful results much faster and more smoothly when all of our efforts are synchronized! The goal of orthodontic care is to create a beautiful smile. This can only be achieved if the braces do not get broken and proper care is taken of your teeth. While we do not want to interfere with your nutrition, we do ask that you avoid certain foods which may break your orthodontic appliances. Here is a list of foods that we have found to be the most common culprits of broken appliances. **DO NOT BITE INTO raw vegetables, carrots and apples; they may be eaten if they are cut into small pieces. Corn on the cob may be sliced off the cob. Obviously this list is not comprehensive, and if you are not sure, ask yourself ”Is it hard, sticky, chewy or crunchy?” If the answer is yes, you shouldn’t eat it. Always take headgear with you each visit. Headgear should be worn all night (approximately 8 hours) plus an additional 6 hours after school. Headgear must be worn every day. Do not wear headgear while playing sports, since serious eye damage could result. The purpose of the headgear is to move back upper teeth (so they do not protrude too much). Some discomfort may be felt, especially in the morning. However, if the headgear is worn every day the discomfort should be minimal. Lack of cooperation with headgear will cause treatment to take longer. Also a less final ideal result will be obtained. If there are any problems with your headgear, please contact the office immediately. DO NOT WEAR RETAINERS WHILE EATING OR DRINKING. CLEAN RETAINERS WITH COOL WATER, NEVER HOT. ONLY USE SOAP TO CLEAN THE RETAINERS, NEVER USE TOOTHPASTE. KEEP RETAINERS AWAY FROM RADIATORS, PETS OR FROM ANY SOURCE OF HEAT. CALL THE OFFICE AT ONCE IF YOU LOSE RETAINERS. IT IS VERY IMPORTANT THAT YOU FOLLOW THESE INSTRUCTIONS CAREFULLY. NOT FOLLOWING THESE INSTRUCTIONS CAN RESULT IN MOVEMENT OF THE TEETH AS WELL AS DAMAGE TO YOUR APPLIANCE. IF RETAINERS ARE LOST OR DAMAGED, THERE WILL BE A FEE TO OBTAIN ANOTHER ONE. ES MUY IMPORTANTE QUE SIGA ESTAS INSTRUCCIONES. EL NO SEGUIRLAS RESULTARA QUE LOS RETENEDORES SE DANEN Y QUE SUS DIENTES SE MUEVAN. SI LOS RETENEDORES SE PIERDEN O SE DANAN SERA RESPONSABLE DE PAGAR POR UNOS RETENEDORES NUEVOS. We may ask you to wear rubber bands (also known as elastics) on your braces. It is an essential part of your treatment and success depends entirely on patient cooperation! It is up to you! Rubber bands, also known as elastics, are used to apply extra force in order to help adjust the teeth. Elastics may be stretched from the upper front teeth to the lower back teeth. 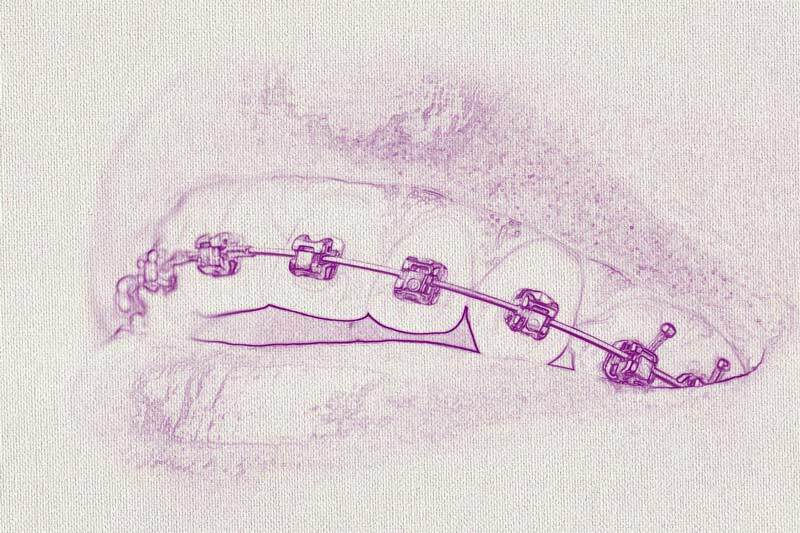 The points of attachment for the elastics depend entirely on how the teeth need to be manipulated. If you are required to wear elastics, they should be worn at all times including during sleep. They may be removed to brush and floss your teeth. The most important part of wearing elastics is to be consistent; they will not be effective if not worn all the time. To maintain the rubber bands’ elasticity, you should change your rubber bands at least once a day. Be sure that you have several bags of elastics, and that you put them in convenient locations so that you have extras on hand should they break. Rubber bands come in many different sizes; each designed for a specific purpose. You should only wear the size that Dr. Stachel provides. You can expect some soreness when you first start to wear rubber bands. If you continue to wear the elastics, the soreness will ease fairly quickly. Additionally, you may feel like your teeth are loose, but that is normal and it too will dissipate. In order for your treatment to be successful, it is imperative that you wear your rubber bands consistently. Your cooperation is a vital part of the use of elastics, and without your help, progression of your treatment will be slowed or halted. Even though they are not comfortable, please follow the instructions and wear your rubber bands! DO NOT STRETCH OUT YOUR TREATMENT, WEAR YOUR ELASTICS!!! They are small doughnut-shaped rubber pieces or springs that are placed in between the teeth. They are used to enlarge the space between your teeth so the “bands” of the braces can be accurately applied to the teeth. As with any movement of the teeth, you may experience some tenderness, but the soreness should dissipate after a few days. If you are experiencing any soreness, try using a hot salt water rinse to soothe the area, or you can try taking two Advil®, Aspirin or Tylenol®. IF YOU LOSE A SEPARATOR, CALL US BEFORE YOUR NEXT APPOINTMENT SO THAT WE CAN REPLACE YOUR LOST SEPARATOR. OTHERWISE, THERE MAY NOT BE ADEQUATE ROOM TO APPLY THE BANDS AND IT MAY DELAY YOUR ORTHODONTIC TREATMENT. Interdental® or Proxabrushes® fit between teeth and help patients to clean around wires without damaging them. Antibacterial Mouthwash can be used to reduce inflammation and prevent infection. For minor sores in the mouth, Peroxyl®, an antiseptic rinse containing hydrogen peroxide may be used up to 4 times per day after brushing. Refer to the product label for specific instructions. A Q-tip® or pencil eraser can be used to push a wire against a tooth if it has come loose and is irritating the cheeks or gums. If it is not possible to reposition the wire so it is more comfortable, place wax over the end of the wire and call our office so that we can set a time to have the wire adjusted and put back into place. Topical Anesthetic Treatments, such as Orabase® or Ora-Gel®, can be applied with with a Q-tip® to any abrasions or sores in the mouth should they occur. The retention period of your orthodontic care begins once your braces have been removed. For your orthodontic treatment to be successful, it is important that you understand that this part of your treatment is just as important as the period when your braces were actively moving your teeth. Now that the teeth have been moved into the desired position, a period of time is necessary to stabilize the teeth and allow the soft tissues and bone to adjust to the new tooth alignment. The final observation and retention period of treatment normally spans approximately 12 months. During this period, appointments will be less frequent. Usually, retainers are worn every day and night for the first 6 months and then worn every night for an additional year. Each person’s requirements are different and a longer period or a different schedule may be recommended. Indefinite part time wear is necessary to maintain the desired changes that have been achieved. Just remember, orthodontic retention is a lifetime commitment to part time wear of your retainers. When you stop wearing your retainer on a regular basis, there may be some minor changes in tooth position, but our goal during the retention phase is to limit these changes while still maintaining a positive functional and aesthetic result. Keep the retainers either in your mouth or in your retainer case. This will avoid loss or breakage that will lead to an extra expense. Brushing the retainer with cool water and liquid hand soap and soaking them in denture cleaner periodically will keep it fresh. NEVER place your retainer in HOT water, as it may become distorted and require replacement. If a brush is not available after eating, rinse off your retainer and place it back in your mouth or in its case. Beware of putting your retainer in your pocket where it may be broken. Also avoid leaving it out where pets can find it or where it can be lost. Call the office immediately for an appointment to replace or repair the retainer. Although there is a fee for retainer repairs and replacements, it is a relatively inexpensive way to protect the investment you have made in your orthodontic care. Once the active phase of your treatment is completed, we will be recommending that a set of x-rays and photographs of your teeth be taken. These images will help evaluate your treatment, plan the retention period and also help determine the position of any wisdom teeth and their impact on your orthodontic care. Congratulations! You are brace free!!!! Make sure to show off your beautiful Jennifer smile!